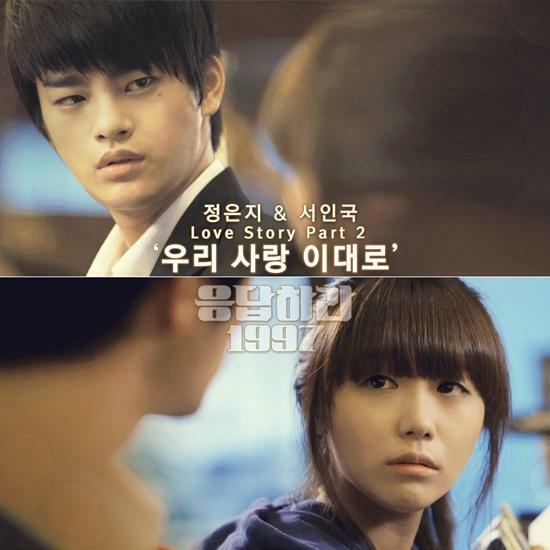 Jung Eun Ji and Seo In Guk sang together for the second song of their love story in Reply 1997. Our Love Like This, the second duet of Jung Eun Ji and Seo In Guk for tvN’s drama Reply 1997, was released through music sites on September 4. Their first love song remake All for You was a great success, sweeping charts soon after its release on August 28 and continuing the Reply 1997 syndrome. While All for You was about Si Won (Jung Eun Ji) and Yoon Je’s (Seo In Guk) young love, Our Love Like This is about how the matured characters hope for love that lasts forever, borrowing its theme from their love story in Reply 1997. The song is a remake of the original OST piece from the film Love Wind, Love Song, which starred Jang Dong Gun and Go So Young as leads a long time before they were wed to each other. The two singers’ voices—Jung Eun Ji’s clear voice and Seo In Guk’s detailed emotional voice—joined together in a collaboration as close as the chemistry the two characters show off in the drama. A rep from CJ E&M, which produces the drama and distributes the music from its OST, said, “Reply 1997 has touched on the nostalgia of those who treasure the 90s, which has led to the success of not only the drama but also of its music. The music video for the song will feature the ring proposal scene between Si Won and Yoon Je along with many other key scenes from the drama. Reply 1997 has been blazing through with a trail of success, staying at the top of viewership rating charts for its time slot six weeks in a row. Jung Eun Ji and Seo In Guk were recognized for their potential in acting despite the drama’s being their debut pieces, and have been receiving love calls for a variety of others following their success.